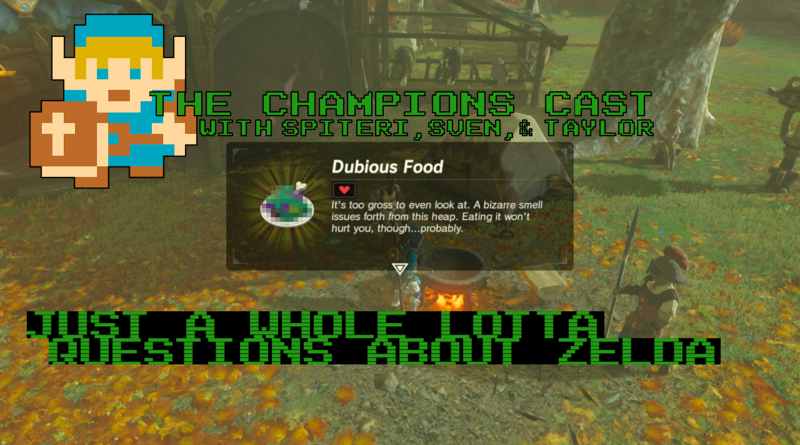 Just a Whole Lotta Questions About Zelda in The Champions’ Cast – Bonus Episode! Buckle in for part two of our double feature Friday night Champions’ flick. We wanted to do a bonus episode to make up for missing last week, but didn’t have any good ideas for what we wanted to talk about, so we did what any self respecting podcast hosts would do: took the easy way out and just had everyone ask us a bunch of questions! That’s right, It’s mailbag time, as we delve into which Champion power is the best, Oracle of Ages vs Seasons, our favorite games to speed run, and more! We also find time to answer hard hitting inquiries such as which of us has the best hair, choosing the Zelda character we would punch in the face if we could, who would win Champions’ Cast Survivor, and the age old question: does Canada really exist? Kick back, relax, and come have fun with the Champions on this lovely Friday night!